Cowdenbeath | Words. Sentences. Stuff. I love away days watching Alloa Athletic and the fact that I don’t go to as many as I’d like means that I tend to appreciate the ones I manage to haul my arse along to. Cowdenbeath is one of the easier trips — twenty miles and a forty minute drive away — so today was my third trip to Central Park in the kingdom of Fife. Alloa went into the match in fourth place, which would see us through to the promotion play-offs while Cowden were at the arse end of the table, languishing comfortably in the relegation play-off spot. I should say at this point that while there’s a lot of badmouthing of the play-offs, mainly due to the fact that out of the 10 teams in the league, only four find themselves at the end of the season with nothing to play for, I rather like the excitement and even though we’re well off the pace this year, there’s still a slim chance we could go up. Strange, then that both teams seemed to be treating the game as a mid-table, end of season encounter and the game itself was frequently beaten for excitement by the weather. It started sunny. Got cloudy. Started to rain. Which changed to sleet. Which decided to chill a little further into snow. And it finished sunny. The ga me was 1-1, and Cowden can probably consider themselves mugged. Makes a change. But the highlight of the day was that myself and my mate Jude were treated to some Cowdenbeath hospitality, both pre and post match. 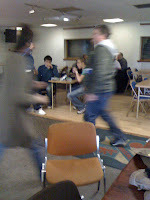 Jude, the main blur in the image as he heads to or from the Gents, works with one of Cowden’s youth coaches who got us into the ground and at the bar for 1pm where we enjoyed lager, crisps and the Arsenal – Liverpool match. At half-time, a wee cup of tea and some sandwiches were on offer and we were able to hob nob with the Alloa injury list. Dougie Wilson, our midfield maestro, revealed that he hopes to be back next week. Hoorah! And at full time, more beer and halfs and a tin of Baa Bru for the driver and some chat with a few guys who turned out to be on the board of Bo’ness Juniors. And not a penny was spent. Except at the Gents. Several times. All in all, a fantastic afternoon out and thanks to Jude’s mate Jim for being a top fella. 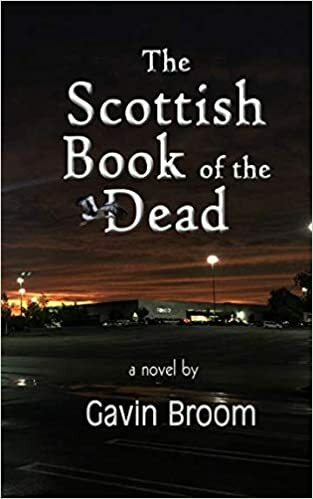 The Scottish Book of the Dead is my debut novel, published by Island City Publishing. The paperback can be ordered from Amazon in the UK, here. Readers in the US can order from Amazon, here. There's also a Kindle version, if you're that way inclined.